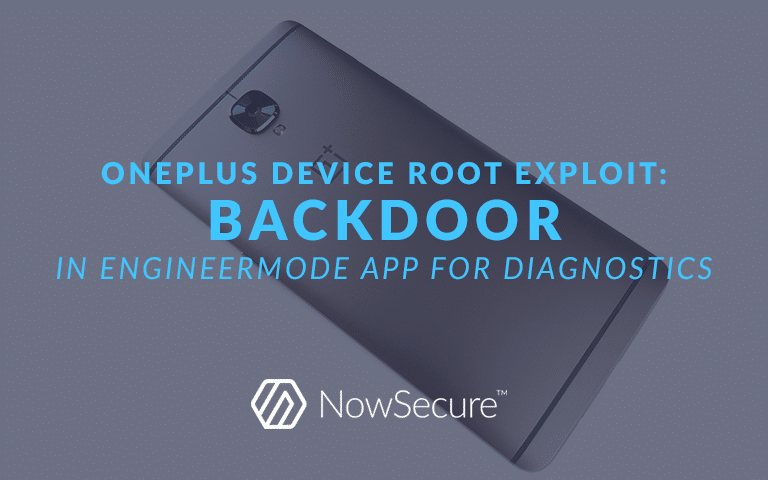 A number of mobile devices manufactured under the OnePlus brand by China’s BBK Electronics are vulnerable to compromise via a factory-installed app called EngineerMode that acts as a backdoor providing root access to affected devices. At this time, the exploit is most useful to an attacker with physical access to a OnePlus device or an owner looking to root their own device. OnePlus devices are more prevalent in markets outside the U.S. such as China and India but are gaining popularity in the U.S. A security researcher posting on Twitter under the pseudonym “Elliot Alderson” (a reference to the “Mr. Robot” TV show protagonist) discovered the problematic app on Monday. Within the hour, the NowSecure Mobile Threat Research Team set to work helping validate the root exploit. In fulfilling the NowSecure mission, we educate customers about the latest mobile security threats and help them maximize the security of the mobile apps they use and develop. Here we explain this new OnePlus root exploit and what financial services organizations, government agencies, and other enterprises need to do to protect themselves. To start, if you or anyone within your organization uses a OnePlus mobile device (especially enterprises with offices in Asia), beware of the EngineerMode app so that you can take appropriate action to mitigate the risk. Why is the EngineerMode app dangerous? OnePlus develops its own customized version of the Android operating system, called OxygenOS, for their branded devices. In this case it appears OnePlus mistakenly left a diagnostic app, EngineerMode, developed by Qualcomm for pre-deployment device testing in the production build of the OxygenOS operating system. What seems especially careless is OnePlus leaving behind a system-signed .apk and a native library with a SHA256 hash of the password that was easily reversed. On Twitter, Qualcomm VP of Product Security Engineering Alex Gantman stated that the EngineerMode app was not authored by Qualcomm but that others had built on top of a past testing app. With the password, the EngineerMode app enables a debugging mode that is generally only needed for development of the device and grants full root privileges on the device via a simple ADB command or potentially by installing an APK from the Play Store. In general, devices that include such a dangerous diagnostic app still on the firmware should not be released to the public because it puts users at risk. On Twitter, OnePlus co-founder Carl Pei thanked the original Twitter poster and said the company would investigate. Entering the password, which turned out to be “angela” (possibly another “Mr. Robot” reference to character Angela Moss), just once grants permanent root access to the Android Debug Bridge (ADB) process via the EngineerMode app — essentially creating a backdoor to root privileges on affected OnePlus mobile devices. adb shell am start -n com.android.engineeringmode/.qualcomm.DiagEnabled --es "code" "angela"
Again, using this shell command triggers the diagnostic mode (or backdoor) and grants future ADB sessions root access, even after the device is rebooted. Is my OnePlus Device affected by this backdoor? How Did NowSecure Get Involved? “Alderson” stumbled upon a factory-installed app called EngineerMode on a OnePlus device and suspected that the app used for diagnostic purposes was a backdoor. The discoverer speculated that the EngineerMode app might provide root access to the OnePlus device given the right password. “Alderson” put out a call for skilled reverse engineers to help him identify the password needed to enable the diagnostic mode through the app and grant root privileges to the ADB process. The NowSecure Research Team, together in the Washington DC area this week for a team summit, happily obliged. Combining their wits with the open-source reverse-engineering framework Radare — created and maintained by a member of the NowSecure Mobile Threat Research Team, sponsored by NowSecure, and built-into the NowSecure Platform™ — the team quickly identified the password and verified the backdoor. The NowSecure team included (from left to right in the photo above) CTO David Weinstein and researchers Francesco Tamagni, Ole André Vadla Ravnås, and Ioannis Gasparis. How did NowSecure find the password? To start, the team disassembled the EngineerMode .apk binary using Radare and collaborated to reverse-engineer the native code extreme programming style. Attackers take the same approach in profiling and targeting Android and iOS apps, and a crucial aspect of the NowSecure mobile app security testing methodology is to approach an app from the attacker’s point-of-view. The team discovered the comparison (memcmp) they sought nearby the code that performed the SHA256 hash of the user-supplied password in the code section for the symbol JNI_OnLoad. Discovering the valid password hash in the binary (79a6a933dfc9b1975e444d4e8481c64c771d8ab40b7ac72f8bc1a1bca1718bef), they found the hash to be trivially reversible to the string “angela” with a mere copy-and-paste into Google search. NowSecure and the NowSecure Platform can help ensure that the mobile apps you develop do not include potentially high-risk mistakes such as this one (or identify similar mistakes in 3rd-party Apple® App Store® and the Google Play™ store apps used by your employees). To find out more about the OnePlus EngineerMode backdoor or NowSecure products and services, e-mail us at [email protected] or fill out our contact form. Developing apps for iOS or Android? Check out our list of 50+ practical recommendations on how to develop more secure apps. During his time at NowSecure Sam advocated for keeping mobile devices, apps, and users secure through mobile app security testing. David has been knee-deep in advanced computer and mobile security research for more than 12 years. As a breaker and builder, he is passionate about solving customer challenges through innovation, teamwork and rigorous engineering practice. David has developed ground-breaking techniques and technologies, spoken at numerous security conferences as an industry expert, and organized a dream-team of security researchers with world-class development and prototyping capabilities. David has spoken and written on a diverse range of topics from envisioning the defensive capabilities of a smart phone charger at IEEE Security and Privacy, to exploitation techniques and the impact of corporate espionage via mobile device compromise at Troopers and RSA conferences. David and his team have discovered critical vulnerabilities, novel attack vectors, and publicly disclosed vulnerabilities impacting millions of devices and users worldwide. Members of the NowSecure research team are incredibly prolific, having developed popular open source tools and projects in the mobile security space including Frida, Radare and the Android Vulnerability Test Suite. David previously served in security and vulnerability research roles at MITRE, the Institute for Defense Analyses, and Pitney Bowes. He has been granted two patents solving thin-client computing and mobile security challenges and has multiple patents pending. David holds a Bachelor’s degree in Computer Systems Engineering and Computer Science from Rensselaer Polytechnic Institute.